The fast MC code developed by Li et al. is based on track-repeating algorithm for proton beam. This code is an extension of MCSIM code,  which uses pre-generated electron tracks for electron transport. For proton transport, the GEANT4 code is used to create the track of high energy protons in the middle of a large homogeneous water phantom, and tracks of 100000 protons with 250 MeV energy are transported. For each step in the proton track, the location, angle, energy, and deposited energy along the track were recorded for the primary protons and all secondary particles. The cutoff kinetic energy for all particles was 200 keV, and the size of the stored data for 100000 protons was 0.8 Gigabyte (GB). This work is an extension of the fast MC code Pre-calculated Monte Carlo (PMC) for protons in which one uses pre-generated tracks for particle transport. The PMC code was initially developed for electron transport with capability of being used for other particles. The main difference between this code and other fast MC codes based on pre-generated tracks is that while the other codes generate the tracks for water and modify them for other materials, in the PMC code, the pre-generated data is collected for each particular material. This technique produces very accurate results near heterogeneities and makes the transport algorithm very simple, since all the physics is handled by a general purpose code. Another difference of the PMC code is that only the track of the primary protons is saved and not the track of the secondary protons as they are treated like a primary proton. This technique decreases the size of the pre-calculated data and makes it possible to generate tracks for various materials. In this work, MCNPX has been used as a reference and for generation of pre-calculated tracks in various materials and energies. This method is based on using pre-generated and stored particle tracks. In this idea, all the possible cases of a particle in clinical range of the energy and materials are transported in MCNPX, and all of data are stored. In Fast Monte Carlo, this information is used and there is no need to calculate the physics of the particle; this saves a lot of time for calculation. For transport of the proton, the pre-generated tracks were repeated, and the energy was deposited along the path in patient geometry built from CT data with voxel size varying between 2-4 mm. In all other materials such as lung tissue, bone, etc., the particle tracks in water are picked up and modified. The scattering angles were repeated for air and soft tissue, although they were adjusted properly for bone, based on the scattering power ratios. The particle step lengths were adjusted based on the density of various materials. The pre-generated data were obtained by simulating protons with a kinetic energy of 250 MeV. It was necessary to determine where to start track repeating along the proton track if the kinetic energy of an incident proton in a realistic proton beam was lower than 250 MeV. The general purpose Monte Carlo code MCNPX  is used for generation of the pre-calculated proton tracks. Tracks of 10000 primary protons were generated for various compounds and energies. The proton energy was 20, 40,… 220, 240, 250 MeV with an energy cut-off of 200 keV. The protons are transported in the middle of a large homogeneous phantom with various materials such as water, lung tissue, bone, and soft tissue. An in-house Fortran code was developed to read and extract the needed information from the ptrac file. This code extracts the position, direction, energy, and deposited energy of a particle in each step. The code also extracts the characteristics of all secondary particles generated by primary protons. Post-processing of the data is required to handle the physics of the various secondary particles, as it is discussed in following sections. 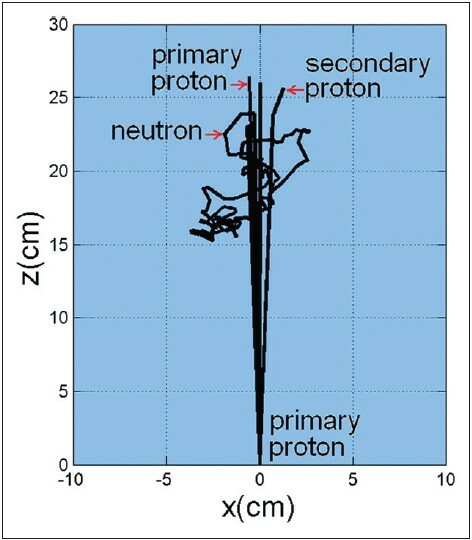 The track of a few protons and their secondaries are illustrated in [Figure 1]. The composition of different materials is taken from ICRU 44 and given in [Table 1]. This material is used in MCNPX to fill up the homogeneous phantoms with different materials. Given is the density of materials: Soft tissue ρ =1.05 g/cm 3 , lung tissue ρ =0.3 g/cm 3 , and bone ρ =1.92 g/cm 3 . 1- Secondary protons: They are treated like primary protons and explicitly transported in the PMC code using a track picked up from pre-calculated data. The energy fluence of secondary protons from primary 150 MeV protons in water is illustrated in [Figure 2]. This is extracted from a ptrac file of 200000 protons in MCNPX. The secondary protons have an energy range from zero to the energy of the primary particle. Therefore, they should be transported explicitly, and their energy cannot be deposited locally or neglected. 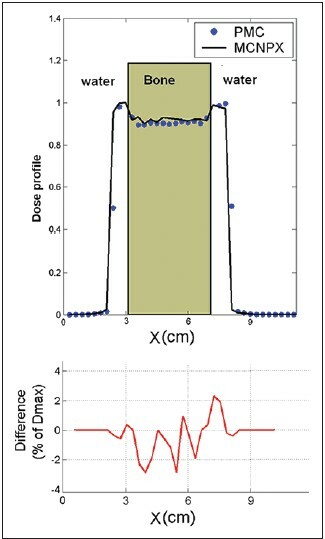 2- Neutrons: Since the energy of the neutron is deposited far from the initial point (as illustrated in [Figure 1]) and their contribution in total dose is less than 0.1%, they can be neglected. This assumption is verified by several groups, ,, and it is the case for most of the fast MC codes for proton transport. 3- All other secondaries: Since other secondaries have a very short clinical range of energy and materials, their energy is deposited locally. An important issue that illustrates the flexibly of the PMC code is that even if all the secondary particles have to be transported explicitly, one just needs to include the track of the particle in the pre-calculated data. This information is already available in ptrac file, and in this case instead of saving just the initial characteristics of secondary particles, the entire track of secondary should be saved in pre-calculated data. If the particle reaches a new material in its path, according to the energy of the proton, a new track from a related material is picked up. For each voxel, the deposited dose is proportional to the fraction of the step inside the voxel. The pre-calculated track of the particle in the PMC code is saved in Cartesian coordinates (x, y, z). In the case of new materials with different densities, such as lung tissue which have varying densities in CT-based phantoms, the entire track is scaled proportional to the inverse of density. When the track of the primary particle is terminated, the secondary particles in stack are transported. The neutrons are neglected and the protons are transported one by one like primary proton and other secondary particles are deposited locally. The energy interpolation could have various approaches. Given a 95 MeV particle a track with closest higher energy neighbor is picked up (i.e. 100 MeV) and within that track, we move down in energy until the step with an energy closest to 95 MeV is met. We then interpolate that step to the 95 MeV point, and the rest of the track is picked up for transport of the particle. In MCNPX, there is an option to choose various physics models through which the particles are transported. ,, The default physics model for proton transport is the Vavilov model for charged-particle straggling,  which is chosen for generation of pre-calculated data in this work. The other option in physics model is based on CSDA (Continuous Slowing Down Approximation) model and as a test the pre-calculated data is generated with this option of MCNPX. 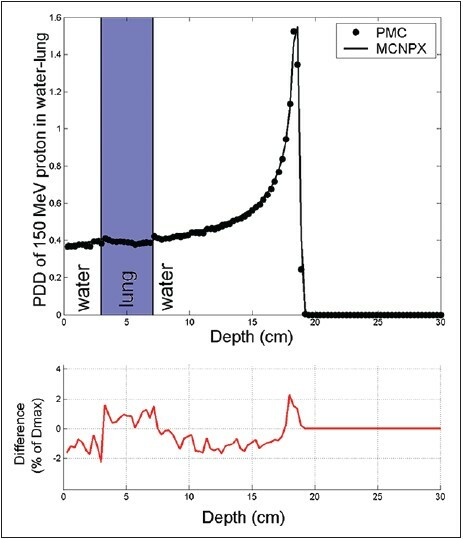 The result of 150 MeV protons in water phantom has been compared to MCNPX in [Figure 3]. 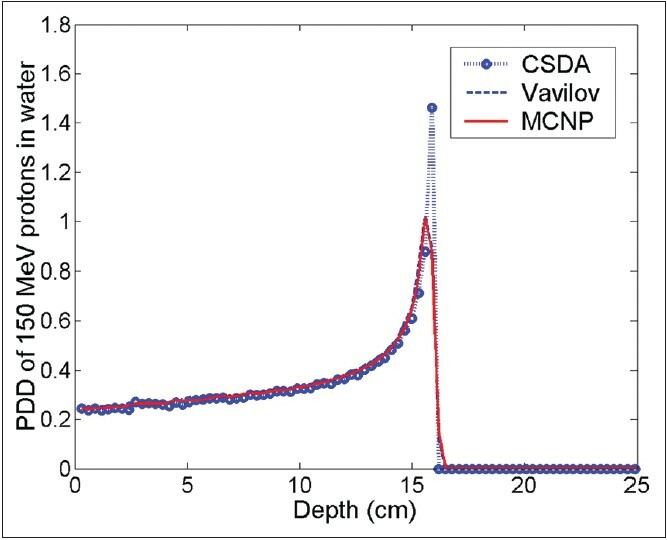 In this figure, the PDD of the PMC code with the Vavilov model, the PMC code with CSDA model, and the MCNPX code (Vavilov model) are compared. The results of the PMC code with CSDA models represents generated very sharp peak with respect to the reference, MCNPX. Other groups , also have declared such sharp peaks with CSDA model in various homogeneous and heterogeneous mediums. Therefore, although the protons mostly travel trough a straight line, the CSDA model is not an appropriate approach for proton transport in clinical range of energies. The ptrac file generated by MCNPX in ASCII format has a very large size since it contains all the detailed information of each step of the primary proton and all secondary particles. For example, the size of the ptrac file for 10000 protons with 200 MeV is 235 MB (Mega Bytes). Our in-house code to process the ptrac file, reads the file and deletes the header and converts it into a binary unformatted file which is 66 MB in the first step. In the second step, the code extracts the needed information (such as track of primary proton and initial parameters of secondary particle) from the file. Finally all the information is saved in unformatted file as an input for the PMC code and the size of file at this stage is 23 MB. For a primary particle, in each step, the code saves five parameters: Position (x, y, z), energy of the particle in the beginning of the step, and deposited energy during the step. The initial characteristics of secondary particles such as particle type, position, direction, and energy are saved in a separate file. The total size of the pre-calculated library for each material is on the order of 100-200 MB. This compact size of the data is reached, since in pre-calculated data of the PMC code, the track of secondary particles is not saved. For verification of the PMC code results, the MCNPX code version 2.5 is used as a reference. An important reminder for MCNPX run is that, in the default setting, the maximum energy of the code for all particles is 100 MeV. This number has to be changed manually in the input file of the code to highest possible energy of the problem (250 MeV in our case) otherwise the physics is wrong. The size of each voxel is 0.3 mm in each direction, and the size of the phantom is 21 × 21 × 30 cm 3 . 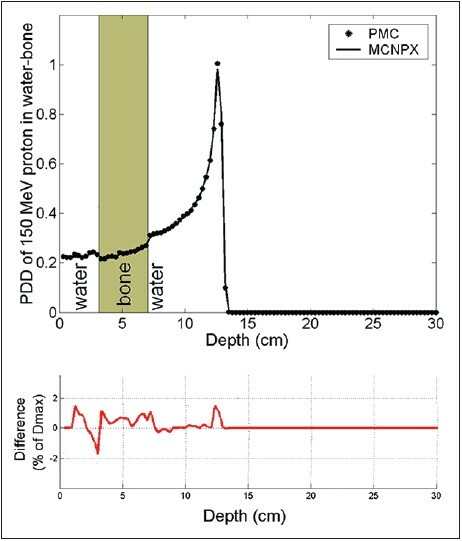 The comparison of the PMC code results with MCNPX for various energies in water is illustrated in [Figure 4]. A monoenergetic incident proton beam with an energy of 100, 150, and 200 MeV and a field size of 10 × 10 cm 2 are used. All the field sizes are defined in the surface of the phantom and the incident particles are distributed uniformly in the surface. 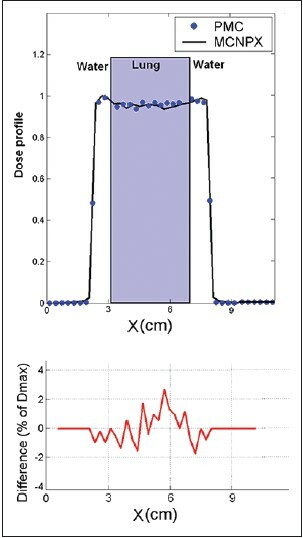 The graph represents the relative percentage depth dose (PDD) along the central axis. There is generally a very good agreement between the PMC code results, and the difference is in the order of 2%. 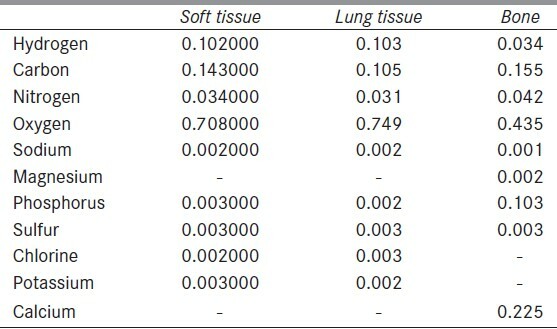 The PMC code results for various materials such as bone, lung tissue, and soft tissue are illustrated in [Figure 5]. There is generally a good agreement between the results with discrepancies up to 2.5%. [Figure 6] illustrates an example of proton transport in heterogeneous phantom. This phantom contains water with a 4-cm slab of bone embedded at a depth of 3 cm. The field size in this case is 4 × 4 cm 2 and the proton energy is 150 MeV. In this phantom, there are both higher to lower and lower to higher density interfaces. The comparison of PDD with MCNPX for the same geometry but with a lung slab is illustrated in [Figure 7]. 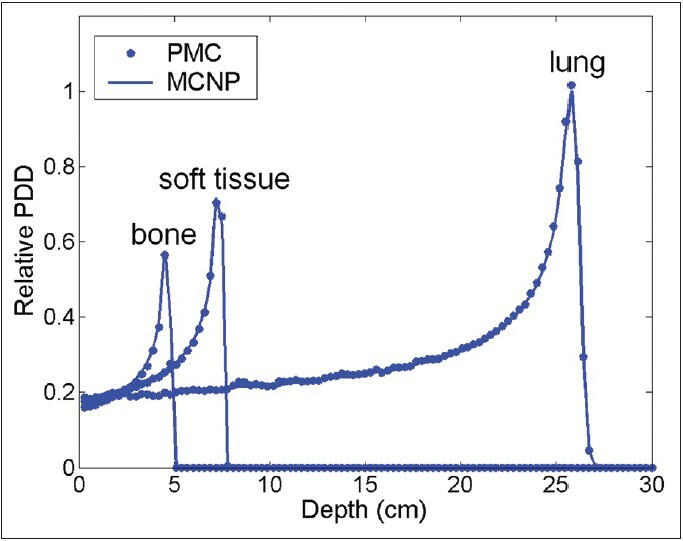 An example of lateral dose profile for a bone and lung slab in water phantom is illustrated in [Figure 8] and [Figure 9]. The difference is between 2%-3%, and the shift of Bragg peak due to the slab of bone and lung is handled very accurately. Transport of 1 million protons with the PMC code takes approximately 60-100 s for various homogeneous and inhomogeneous materials. All the runs, including MCNPx runs, were done in a desktop computer with Intel Core 2 Duo 2.66 GHZ CPU. The input for the PMC code is a 3D matrix of real numbers related to the density of each voxel. In a typical phantom, we may have different materials with various densities. For example, bone density in may vary from 1.6 g/cm 3 to 3 g/cm 3 . For proton transport in one material with various densities as mentioned in Section 3.5, the pre-calculated track is scaled using the density of each voxel on the fly. 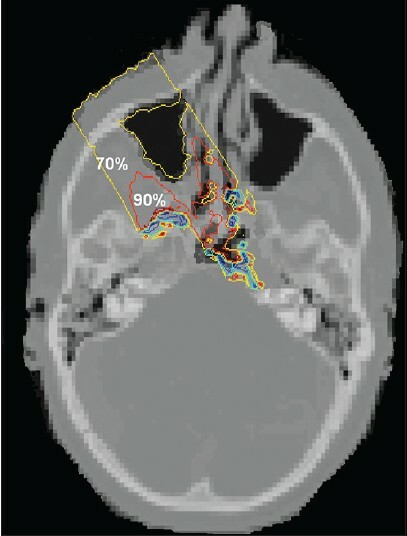 The image of the head and related isodoses are illustrated in [Figure 10]. The resolution of the phantom is 2 mm 3 . The isodose curves represent the dose distribution of 100 MeV protons incident on 5 × 5 cm 2 field size. The effect of the air cavities and boney structures on the isodose curves is handled properly and can be observed. The most important advantage of using pre-calculated data from a general purpose MC code is the accuracy of the results. It is mentioned before other fast MC codes for proton have up to 10% errors in heterogeneous materials. The accuracy of this method is due to the fact that when, for example, during the transport of a particle in a tissue if we come to a boundary of a new material, bone, we do not modify the track of the particle in tissue for bone transport; a new track is picked up from the pre-calculated tracks of bone. On the other hand the large size of the pre-calculated data, in the range of the 1 GB, makes some limitations in application. For parallel processing, the code needs huge amount of RAM for each core. The load of the data on the RAM for itself for the first run takes some time; however, this task is done once for all runs as long as the computer in not turned off. Because of the large amount of data, it is not possible to run the codes in a graphics processing unit (GPU) that has very fast calculation times as well. The fast MC code, PMC has been developed for proton particle. The pre-calculated data is generated by the general purpose MC code, MCNPX. The major difference between the PMC code and other fast MC codes based on pre-generated data is that the pre-generated data is calculated for each particular material; therefore, all the physics is calculated by the general purpose code. This fact makes the physical calculation of the code very simple especially for proton particles since there are many different types of secondary particles that are produced. The pre-calculated data contains tracks of 10000 protons for various energies and materials and the size of the pre-calculated data is in the order of 100 MB for each material with the size of the entire data being as high as 1 GB. The PMC code generally produced accurate results, and the transport of protons near the heterogeneities was performed accurately. The authors are grateful to Dr. Christoph Furstoss from McGill University for very useful help and discussion in application of MCNPX. 1. Smith R. Proton therapy. Phys Med Biol 2006;45:R491-504. 2. Miller DW. A review of proton beam radiation therapy. Med Phys 1995;11:1943-53. 3. Knopf AC, Boye D, Lomax A, Mori S. Adequate margin definition for scanned particle therapy in the incidence of intrafractional motion. Phys Med Biol 2013;58:6079-94. 4. Jia Y, Beltran C, Indelicato DJ, Flampouri S, Li Z, Merchant TE. Proton therapy dose distribution comparison between Monte Carlo and a treatment planning system for pediatric patients with ependymoma. Med Phys 2012;39:4742-7. 5. Liu W, Zhang X, Li Y, Mohan R. Robust optimization of intensity modulated proton therapy. Med Phys 2012;39:1079-91. 6. Paganetti H, Niemierko A, Ancukiewicz M, Gerweck LE, Goitein M, Loeffler JS, et al. Relative biological effectiveness (RBE) values for proton beam therapy. Int J Radiat Oncol Biol Phys 2002;53:407-21. 7. Hong L, Goitein M, Bucciolini M, Comiskey R, Gottschalk B, Rosenthal S, et al. A pencil beam algorithm for proton dose calculations. Phys Med Biol 1996;41:1305-30. 8. Bortfeld T. An analytical approximation of the Bragg curve for therapeutic proton beams. Med Phys 1997;24:2024-33. 9. Szymanowski H, Mazal A, Nauraye C, Biensan S, Ferrand R, Murillo MC, et al. Experimental determination and verification of the parameters used in a proton pencil beam algorithm. Med Phys 2001;28:975-87. 10. Berger MJ. Penetration of proton beams through water I. Depth-dose distribution, spectra and LET distribution, Report NISTIR 5226, National Institute of standards and technology, Gaithersburg, MD, 1993. 11. Lee M, Nahum AE, Webb S. An empirical method to build up a model of proton dose distribution for a radiotherapy treatment planning package. Phys Med Biol 1993;38:989-98. 12. Russell KR, Isacsson U, Saxner M, Ahnesjo A, Montelius A, Grusell E, et al. Implementation of pencil kernel and depth penetration algorithms for treatment planning of proton beams. Phys Med Biol 2000;45:9-27. 13. Szymanowski H, Oelfke U. Two-dimensional pencil beam scaling: An improved proton dose algorithm for heterogeneous media. Phys Med Biol 2002;47:3313-30. 14. 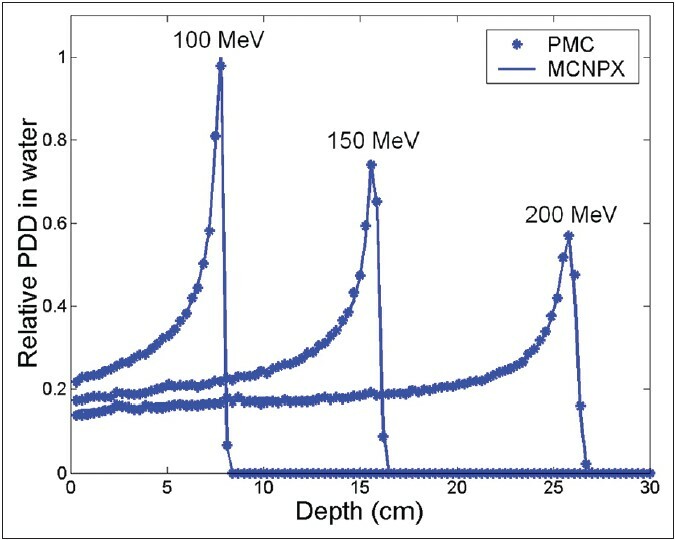 Soukup M, Fippel M, Alber M. A pencil beam algorithm for intensity modulated proton therapy derived from Monte Carlo simulations. Phys Med Biol 2005;50:5089-104. 15. Haisen SL, Romeijn HE, Fox C, Palta JR, Dempsey JF. A computational implementation and comparison of several intensity modulated proton therapy treatment planning algorithms. Med Phys 2008;35:1103-12. 16. Lomax AJ, Bohringer T, Bolsi A, Coray D, Emert F, Goitein G, et al. Treatment planning and verification of proton therapy using spot scanning: Initial experiences. Med Phys 2004;31:3150-7. 17. Rana S, Zeidan O, Ramirez E, Rains M, Gao J, Zheng Y. Measurements of lateral penumbra for uniform scanning proton beams under various beam delivery conditions and comparison to the XiO treatment planning system. Med Phys 2013;40:091708. 18. Agostinelli S, Allison J, Amako K, Apostolakis J, Araujo H, Arce P, et al. GEANT4-A simulation toolkit. Nucl Instrum Methods Phys Res A 2003;506:250-303. 19. Fasso A, Ferrari A, Sala PR. "Electron-photon transport in FLUKA: Status,'' in Advanced Monte Carlo for Radiation Physics, Particle Transport Simulation and Applications, Proceedings of the Monte Carlo 2000 Conference, Lisbon, October 23-26, 2000. In: Kling A, Barao F, Nakagawa M, Tavora L, Vaz P, editors. Berlin: Springer-Verlag; 2000. p. 159-64. 20. Fasso A, Ferrari A, Ranft J, Sala PR. FLUKA: Status and Prospective for Hadronic Applications. in Advanced Monte Carlo for Radiation Physics, Particle Transport Simulation and Applications, Proceedings of the Monte Carlo 2000 Conference, Lisbon, October 23-26, 2000. In: Kling A, Barao F, Nakagawa M, Tavora L, Vaz P, editors. Berlin: Springer-Verlag; 2000. p. 955- 60. 21. Brown FB. MCNP-A general Monte Carlo-particle transport code, version 5. Report LA-UR-03 1987, Los Alamos National Laboratory, Los Alamos, NM, 2003. 22. Parodi K, Paganetti H, Cascio E, Flanz JB, Bonab AA, Alpert NM, et al. PET/CT imaging for treatment verification after proton therapy: A study with plastic phantoms and metallic implants. Med Phys 2007;34:3369-87. 23. Pignol JP, Cuendet P, Brassart N, Fares G, Colomb F, M'Bake Diop C, et al. 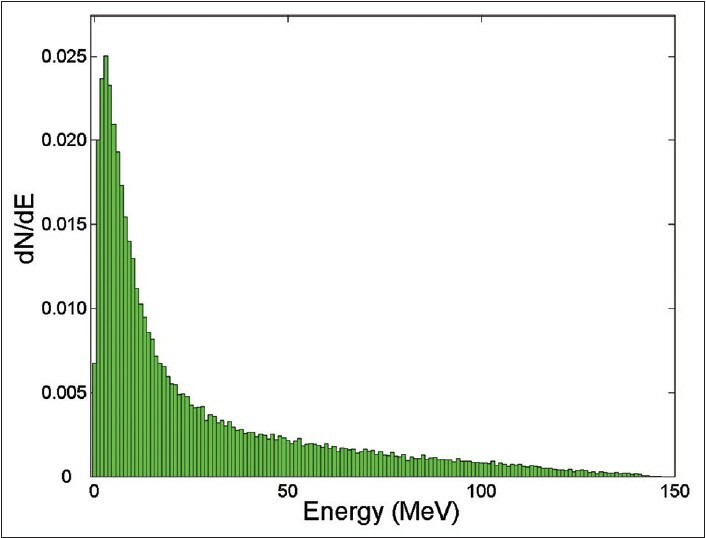 Combined use of FLUKA and MCNP-4A for the Monte Carlo simulation of the dosimetry of 10 B neutron capture enhancement of fast neutron irradiations. Med Phys 1998;25:885-91. 24. Lee CL, Zhou XL, Kudchadker RJ, Harmon F, Harker YD. A Monte Carlo dosimetry-based evaluation of the 7Li (p, n) 7Be reaction near threshold for accelerator boron neutron capture therapy. Med Phys 2000;27:192-202. 25. Knopf A, Parodi K, Paganetti H, Cascio E, Bonab A, Bortfeld T. Quantitative assessment of the physical potential of proton beam range verification with PET/CT. Phys Med Biol 2008;53:4137-51. 26. Trovati S, Ballarini F, Battistoni G, Cerutti F, Fassò A, Ferrari A, et al. Human exposure to space radiation: Role of primary and secondary particles. Human exposure to space radiation: Role of primary and secondary particles. Radiat Prot Dosimetry 2006;122:362-6. 27. Kimstrand P, Tilly N, Ahnesjö A, Traneus E. Experimental test of Monte Carlo proton transport at grazing incidence in GEANT4, FLUKA and MCNPX. Phys Med Biol 2008;53:1115-29. 28. Jabbari K, Keall P, Seuntjens J. Considerations and limitations of fast Monte Carlo electron transport in radiation therapy based on precalculated data. Med Phys 2009;36:530-40. 29. Fippel M, Soukup M. A Monte Carlo dose calculation algorithm for proton therapy. Med Phys 2004;31:2263-73. 30. Li JS, Shanine B, Fourkal E, Ma CM. A particle track-repeating algorithm for proton beam dose calculation. Phys Med Biol 2005;50:1001-10. 31. Tourovsky A, Lomax AJ, Schneider U, Pedroni E. Monte Carlo dose calculations for spot scanned proton therapy. Phys Med Biol 2005;50:971-81. 32. Kawrakow I, Fippel M, Friedrich K. 3D Electron Dose Calculation using a Voxel based Monte Carlo Algorithm (VMC). Med Phys 1996;23:445-57. 33. Kawrakow I, Fippel M. Investigation of variance reduction techniques for Monte Carlo photon dose calculation using XVMC. Phys Med Biol 2000;45:2163-83. 34. Kawrakow I, Fippel M. VMC++, a MC algorithm optimized for electron and photon beam dose calculations for RTP. in Proceedings of the 22 nd Annual International Conference of the IEEE (Engineering in Medicine and Biology Society, Piscataway, NJ; 2000. 35. Kawrakow I. 2000. VMC++, electron and photon Monte Carlo calculations optimized for radiation treatment planning.In: A. Kling, F. Barao, M. Nakagawa, L. Tavora and P. Vaz (eds), Advanced Monte Carlo for Radiation Physics, Particle Transport Simulation and Applications, Proceedings of the Monte Carlo 2000 Conference, Springer-Verlag, Berlin, p. 229-36. 36. Ma C-M, Li JS, Pawlicki T, Jiang SB, Deng J, Price RA, et al. MCSIM-a Monte Carlo dose calculation tool for radiation therapy. Proc. 14 th ICCR. Korea: Seoul; 2004. p. 123-6. 37. Los Alamos National Laboratory 2002; MCNPX User's Manual Version 2.4.0, LANL Report LA-CP-02-408. 38. Facure A, da Silva AX, da Rosa LA, Cardoso SC, Rezende GF. On the production of neutrons in laminated barriers for 10 MV medical accelerator rooms. Med Phys 2008;35:3285-92. 39. Sadeghi M, Raisali G, Hosseini SH, Shavar A. Monte Carlo calculations and experimental measurements of dosimetric parameters of the IRA-103Pd brachytherapy source. Med Phys 2008;35:1288-94. 40. Bolewski AJ Jr, Ciechanowski M, Dydejczyk A, Kreft A. On the optimization of the isotopic neutron source method for measuring the thermal neutron absorption cross section: Advantages and disadvantages of BF3 and 3He counters. Appl Radiat Isot 2008;66:457-62. 41. Jaradat AK, Biggs PJ. Tenth value layers for 60Co gamma rays and for 4, 6, 10, 15, and 18 MV x rays in concrete for beams of cone angles between 0 degrees and 14 degrees calculated by Monte Carlo simulation. Health Phys 2007;92:456-63. 42. Bozkurt A, Bor D. Simultaneous determination of equivalent dose to organs and tissues of the patient and of the physician in interventional radiology using the Monte Carlo method. Phys Med Biol 2007;52:317-30. 43. ICRU-Report No. 44: Tissue substitutes in radiation dosimetry and measurement in International Commission on Radiation Units and Measurements, 1989. Available from: http://physics.nist.gov/PhysRefData/XrayMassCoef/tab2.html [Last accessed on 2013 Feb 10]. 44. Verhaegen F, Palmans H. A systematic Monte Carlo study of secondary electron fluence perturbation in clinical proton beams (70-250 MeV) for cylindrical and spherical ion chambers. Med Phys 2001;28:2088-95. 45. Paganetti H. Nuclear interactions in proton therapy: Dose and relative biological effect distributions originating from primary and secondary particles. Phys Med Biol 2002;47:747-64. 46. ICRU-Report No. 63 2000: Nuclear Data for Neutron and Proton Radiotherapy and for Radiation Protection. in International Commission on Radiation Units and Measurements. Med. Phys. 2001; 28, 861. 47. Chetty I, Curran B, Cygler J, DeMarco JJ, Ezzell G, Faddegon B, et al. Guidance report on clinical implementation of the Monte Carlo method in external beam radiation therapy treatment planning: Report of the AAPM Task Group No. 105. Med Phys 2007;34:4818-53. 48. DeMarco JJ, Solberg TD, Smathers JB. A CT-based Monte Carlo simulation tool for dosimetry planning and analysis. Med Phys 1998;25:1-11. 49. Szymanowski H, Oelfke U. CT calibration for two-dimensional scaling of proton pencil beams. Phys Med Biol 2003;48:861-74. 50. Hayashi K, Tayama R, Shibata K, Honda T, Morimoto M, Izumida T, et al. Development of a simple method to evaluate medical staff radiation dose and its application to a software system supporting PET facility operation. Radiat Prot Dosimetry 2005;116:196-201. 51. Duggan DM. Improved radial dose function estimation using current version MCNP Monte-Carlo simulation: Model 6711 and ISC3500 125I brachytherapy sources. Appl Radiat Isot 2004;61:1443-50. 52. Zamenhof R, Redmond E, Solares G, Katz D, Riley K, Kiger S, et al. Monte Carlo-based treatment planning for boron neutron capture therapy using custom designed models automatically generated from CT data. Int J Radiat Oncol Biol Phys 1996;35:383-97. 53. Vavilov PV. 1957; Ionization Losses of High-Energy Heavy Particles. Soviet Physics JETP 5,1957;749-51. 54. Ciangaru G, Polf JC, Bues M, Smith AR. Benchmarking analytical calculations of proton doses in heterogeneous matter. Med Phys 2005;32:3511-23. 55. Carlssonyx ÅK, Andreoyz P, Brahmey A. Monte Carlo and analytical calculation of proton pencil beams for computerized treatment plan optimization. Phys Med Biol 1997;42:1033-53.